This is the second lecture in a series of four by Adrian Rifkin, Professor of ARt Writing, in association with Goldsmiths’ MFA in Art Writing. Rifkin takes up Jaques Ranciere’s notion of the ‘aesthetic regime of art’ to explore possibilities of an aesthetic regime of writing on art, and the consequences of art writing for other practices. 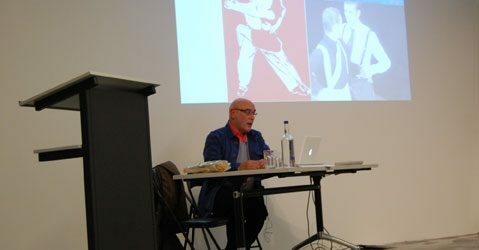 Yve Lomax is Professor in Art Writing at Goldsmiths and Senior Research Tutor at the RCA. She is author of Writing the Image (2000), Sounding the Event (2005) and Passionate Being (2010) all published by I.B Taurus. She currently working on a volume entitled Pure Means: writing, photographs and an insurrection of being.